To help preserve the natural values in this park, please do not discharge sewage in anchorages, but keep sewage contained in holding tanks while at anchor. 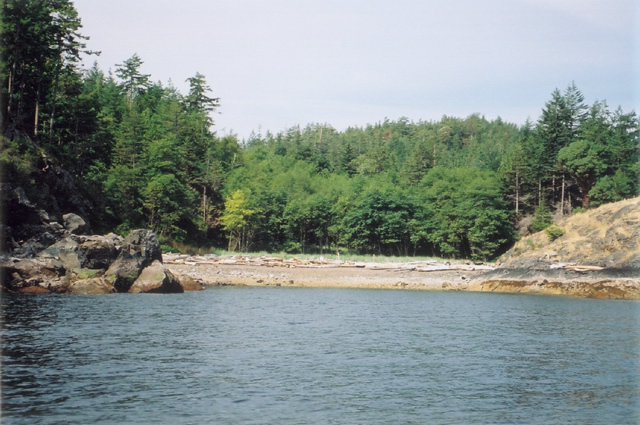 This park is a dry island in Georgia Strait and has a rocky coastline and small bays. The forested upland and pebble beach are backed by impressive Spyglass Hill. While exploring the island you can view the old homestead rock walls and orchards. Simson Park is accessible by boat only, has limited anchorage for large boats and there are no facilities in the park. Special Features: There is a wetland area with a beaver pond that is easily accessed from Farm Bay. Located on South Thormanby Island close to Halfmoon Bay on the Sunshine Coast. Access is by boat only from Halfmoon Bay. History: This park is named after the family of Vancouver pioneer Calvert Simson, whose family donated the land. Approved Simson Provincial Park Master Plan [PDF] is available in pdf format. There is some good canoeing and kayaking when weather permits. Paddlers can access paddle-in sites. There are rentals available at Halfmoon Bay and Sechelt. Please respect private property. Saltwater/ocean fishing. Anyone fishing or angling in British Columbia must have an appropriate licence. There are no developed hiking trails; however, there are old skidder roads that criss cross the park. Care must be taken as these are not marked. Please Respect Private Property. Ocean swimming available. The beaches are rocky, gravel and cobbles with barnacles. All the bays have a south, southeast exposure and are subject to Small Craft Warnings. Take care as there is little protection from the winds and waves. There are no lifeguards on duty at provincial parks.